Just got the TWC Maxx upgrade. I have some questions about my modem, router, and configuration. I have this modem configured as a bridge into this router (v2) and my speed seems maxed out at 100ish. Shouldn't it be good for 300? Is there any settings I need to check on either device? Since it seems pretty common for people to post their status/frequency page, I'll go ahead and do that. I have other screenshots of both device configurations if necessary. Re: Just got the TWC Maxx upgrade. 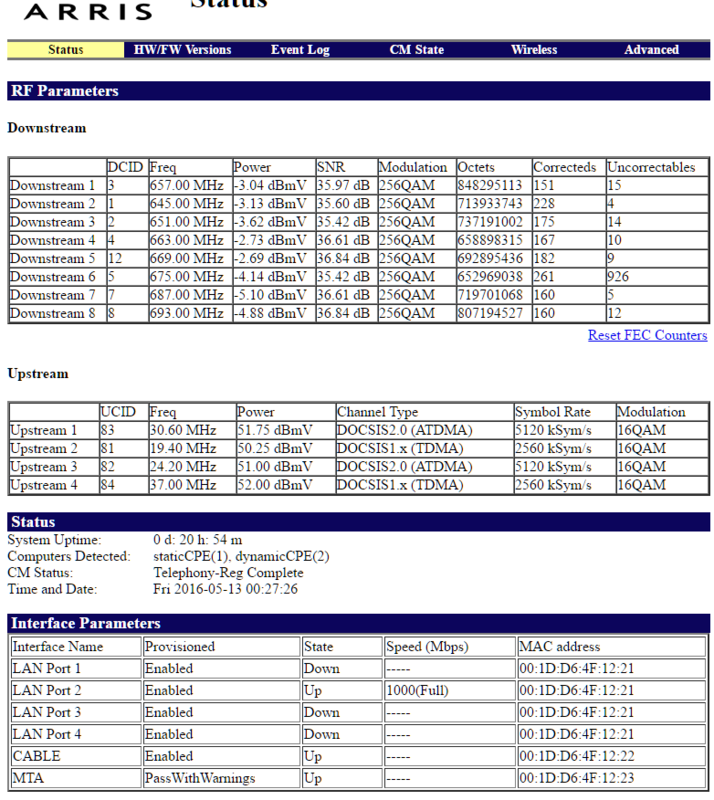 I have some questions about my modem, router, and configuration. I can't speak for your screensots, but according to Time Warner's website that modem is only supported for up to speeds of 100Mbps (http://www.timewarnercable.com/en/support/equipment-manuals.html#equipment-internet-modems). As for the router, that should easily support speeds of 300Mbps. 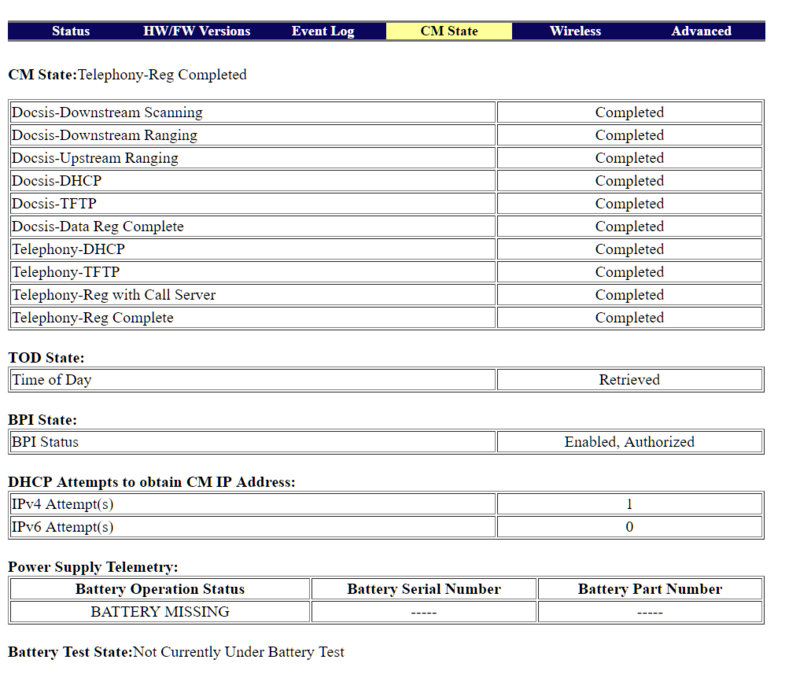 If you're renting a modem from Time Warner, they should have notified you if you would need a new modem or not. They have a webpage (not sure of the link) where you can request a replacement modem or you can call them up. it's an 8x4 and will only be provisioned up to 100/10 service. What speed are you paying for? Previously I was getting the 30 down package. Turbo? And yes I am renting so is it possible to bring the modem to a local store and swap them out? Or does it require an in-home visit? "It should be at the first 2 way after the pole,"
Do you have cable TV? if not there should be no splitters in line. Your levels indicate there are. Looks like you also have phone service with us so theres a couple of options for you. 1) Bring your TG862 into the office and they will replace it with another combo unit such as the Arris TG1762. 2) Leave your MTA (modem with phone) exactly where its at now. 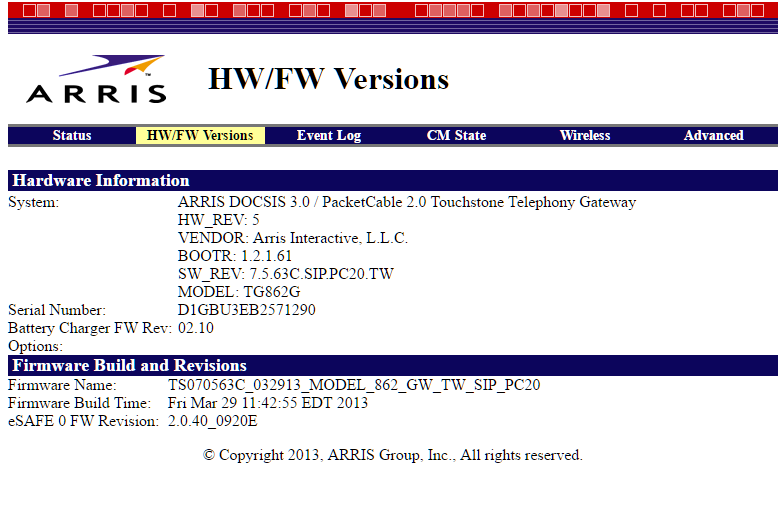 Head into a local cable store and see if they have modem only units available like the Arris 6183. They'll add a code to disable the data port on your old one and you just plug your router into the new one. Not many places will have these in models stock so your mileage may vary. 3) If they only have combo router/modems available and you still wish to lease, I'd choose the Arris DG1670 (same firmware as 1672 but w/o phone) first, over the Ubee/Technicolor. You can always trade it in later. Option 2,3,4 require you to have a splitter for both modems so your signal will be degraded. The loss is about 4dB which imo, isn't really too much but I personally would be more botherred by the extra flashing lights and second box and wires. A lot people on the forums recommend on buy your own modem but now that the Charter merger is around the corner, I'd recommend renting a modem for now, or a few months. Charter doesn't charge a rental fee for modems currently so you can potentially save some money if they keep that practice. So in this case I'd recommmend Option 1. It's also an easier swap too since your wiring stays the same. Since you're bridging it, you can also tell them you want to "opt out of wifi". This tells them to put a wifi opt code on the account. Thank you very much for the response, Funk. I had no idea the splitter degraded performance - the tech that installed it told me "zero percent. it's all 0s and 1s" after I asked if it would. I wonder if I can re-configure everything to be more optimal. I think I will go with Option 1, I'll try to call the local office and specifically ask for TG1762 if that's what you recommend. Is that one considered the best (that TWC offer for lease)? EDIT: Yes I do have Cable, internet, and phone package. You need to make sure the modem is on the first 2 way splitter, upstream is at max and can't go any higher reliably. Looks like too many or open port splitters right now., CHANGING MODEMS WILL NOT HELP SIGNAL ISSUES! I'll try to call the local office and specifically ask for TG1762 if that's what you recommend. It's actually a TG1672, and I wouldn't recommend it. My parents have one, and it works OK for them because they mostly use a single computer with a wired connection. The wireless on the TG1672 is weak, it has no external antenna, so when I'm up there and want to use my laptop wirelessly I need to be in the same room as the TG1672 to get a good signal level. If you will be satisfied with single-room wireless coverage, you'll probably be OK, too. If you're looking for whole apartment/house wireless coverage, you probably want something else. And as MsRaye points out, you'll need to get your signal level issue resolved, or no modem (or modem/router combo) will give you good service.